The westonzoyland carnival club put on one of the biggest fundraisers this year, with Role the Penny up to laser tag. 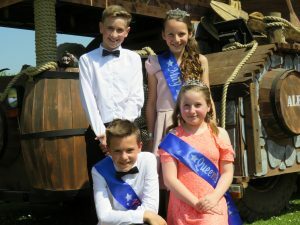 We had four wonderful children from westonzoyland primary school to act as Mayday King and Queen and there two assistants. The organiser Chris Burge had to say: “Mayday went very well. One of the best ever. Mainly due to the lovely weather. Good progress on this year’s 2018 entry. We are planning regular bingo evenings and quiz. This years mayday was packed with fun filled events such as kick boxing, dog shows and much more. There was also laser tag, shoot throw the hoop, hook a duck for the young ones, there was also stalls inside and much more attractions. This event appears on the first Monday of may on the westonzoyland village hall grounds. Visit the Westonzoyland Carnival club’s YouTube Channel to watch the promotional video.